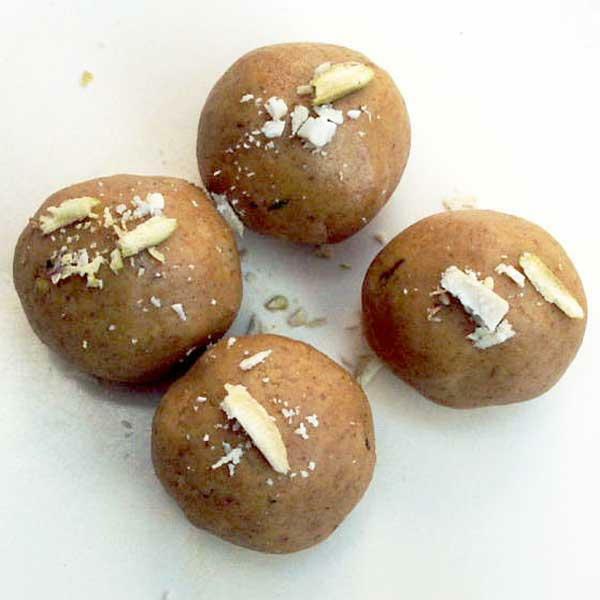 Laddoos are made from many different ingredients, besan ones being probably one of the most popular and most commonly home-made laddoos in India. Besan is the flour made from Bengal gram or small, black chickpeas. Chop nuts or buy ready chopped ones. Heat clarified butter or ghee in a heavy bottomed wok or karahi. Add gram flour or besan. Fry on medium heat, stirring constantly, until besan changes colour to reddish brown and emits the roast aroma. Ghee also separates from the besan at this stage. Do not be in a hurry. Besan must be properly fry-roasted on medium fire. Take the pan off the fire and let it cool, enough to be able handle the mix in your palms. Take approximately 1-2 tbsp. of the prepared mix in one hand. Squeeze and roll it between the palm and fingers of that hand, to make it into small but firm ball. Squeezing is necessary to make the laddoo compact enough to hold together. Continue until all laddoos are made.